We drive a stake into the ground. Sometimes God shows us we need to make an abrupt change in our lives. Something happens and God uses it to significantly change the direction we are headed. Most of the time, God transforms us gradually – baby steps. But, every once in while, we get an epiphany from God – our eyes are opened to God’s desire to make a big change in us – and we are compelled to drive a stake into the ground. From this day forward, we will be different. There’s no going back. I had one of the epiphanies 6 months ago about eating right and daily obeying God’s commands in the Bible regarding food. I am forever changed. My eyes are opened to how God wants me to use food in my life and there is no going back. The stake is in the ground. 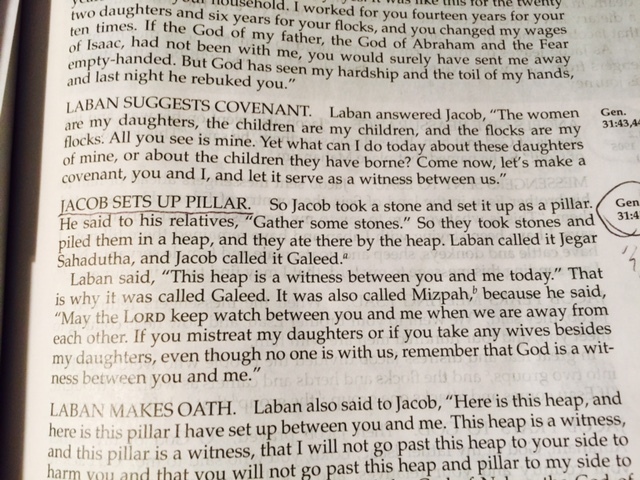 We read in Genesis that Laban and Jacob made a covenant and Jacob set up a pillar to remind each of them of their promises to one another. From this day forward, we will not harm one another. A pillar in the ground. From now on, our behavior is going to be different. God is transforming us as we walk this road of faith. The Holy Spirit is convicting us of the truth in God’s word which we need to apply to our lives. God is teaching us. He is guiding us. If we are listening, we should be experiencing these epiphanies and working with God has he transforms us from the inside outside. We should be more like Christ today than we were a year ago. It doesn’t matter if we’ve been on this road of faith for 50 days or 50 years, God is renewing our minds and remodeling our hearts.